Hey everyone! Guess what time it is? 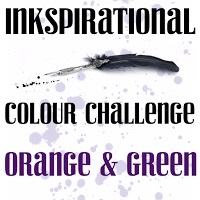 It's time for a new challenge over at Inkspirational! Yay! We've got a colour challenge for you this time. It's Orange and Green. I do hope you'll join in on the fun with us! You must check out the other DT's projects too. They are all fabulous! We also have a wonderful Guest Designer joining us by the name of Chriss from the Botanical Cafe. She has made an amazing card to inspire you. Well, I hope you enjoyed your visit and I hope you all have a fantastic day! Darnell's NBUS Challenge - the pumpkin stamp from Micheals and the sentiment stamp are both NBUS! 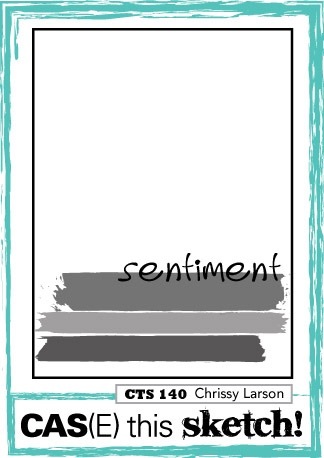 City Crafter Challenge Blog - "feeling flat", make a flat card. My card is a one layer. Fabulous coloring and masking! Love it! This is fabulous, Kim - a clever way to use the colour combo and your masking is perfect! Your coloring is fabulous. And it's the perfect card for this time of the year. You nailed our theme too! Thanks so much for joining us at CCCB this week! Pumpkins - just the perfect use for the colour combo and these are perfectly coloured (love the detail) . Wonderful masking for a great design. Lovely CAS card! I love your colouring and the orange green combination! Thank you for joining ATSM. Love this terrific scene! Beautiful Fall colours and awesome masking! Wow... those pumpkins look great! As always, the coloring is fantastic and your design is really fresh. A great fall card! I came 'this close' to using pumpkins - actually, I made a pumpkin background card, coloured it, had no idea what to do next and trash it - before settling on my goofy card. Your pile o'pumpkins is gorgeous, Kim! Need to find a different pumpkin stamp then the one I used and give your design a try. Love this! Awesome masking and coloring! Love the pumpkins and the design! Oh, I love your pumpkin patch! It's so fun! Fabulous take on the sketch! Fabulous coloring and masking! WOW! Love it!